This year for some reason I got out the camera on my daughter's last day of Kindergarten while we were waiting for the school bus. She was wearing turquoise and pink so that told me what colors to use. The pink paper is a pink grid that comes from the Razzleberry Lemonade paper collection. On that I stamped some butterflies from the "Priceless" stamp set in Melon Mambo ink. I used Melon Mambo dotted grosgrain ribbon for embellishment along with the Scallop Ribbon Border punch and a die cut flower. 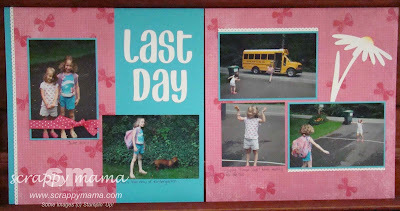 Back to scrapbooking....haven't posted any pages in a while! 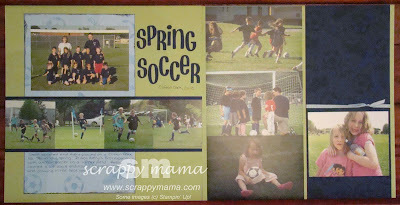 Here's a soccer layout that I made with an old retired Stampin' Up! set called "Just Soccer". I like this layout because I was able to put 9 pictures on 2 pages. The stamping was done on the light blue background on the left and the dark blue background on the left. This is a nice sketch that I'll have to use again. I designed this card for the Catalog Unveiling that I had earlier this month. It's a cute birthday card using the new hostess set "Birthday Bakery" and the new patterned paper collection "Sunny Garden." The colors for this card are So Saffron, Poppy Parade, Early Espresso, and Whisper White. I used some new Early Espresso 1/8 inch Taffeta ribbon and the Dotted Scallop Ribbon Border Punch as well. I just decided to take the plunge into the Simply Adorned line of custom jewelry that Stampin' Up! has. 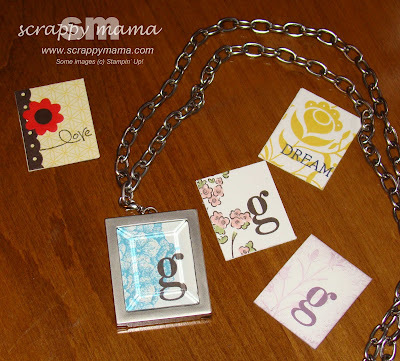 I've been playing around with stamping on tiny pieces of paper to put inside the charm. I still need some more practice, but here's what I have so far. 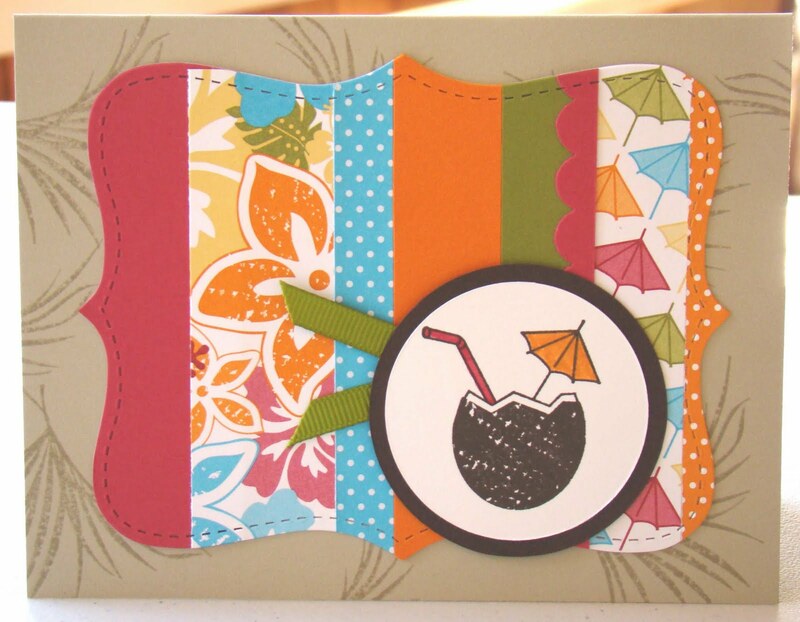 This is another card using the Tropical Party Set and the coordinating Island Oasis paper. Since this card was inspired by the cover of the Stampin' Up! catalog, it counts as Catalog Inspiration Challenge #3. 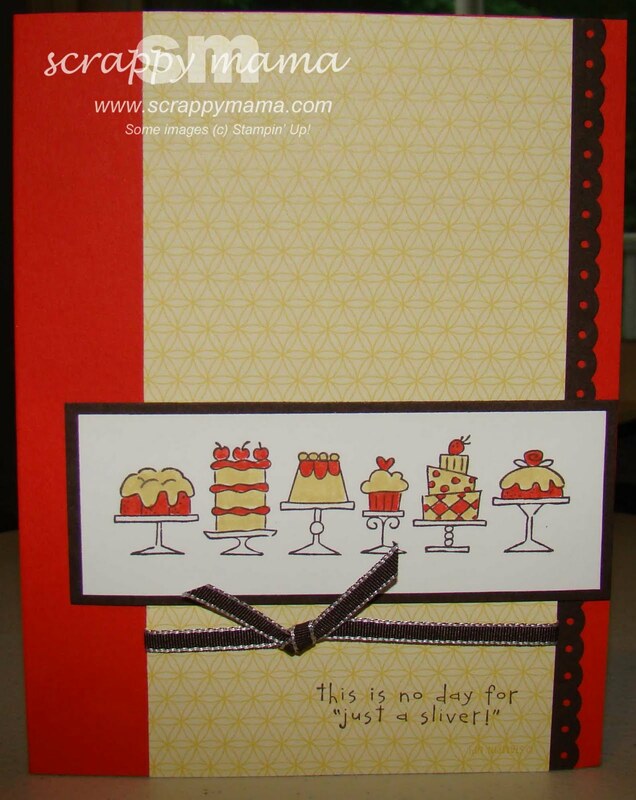 The Friends card on the catalog cover usies a variety of patterned papers and the Top Note Big Shot die to create a "Friends" Card. I used the Island Oasis paper and some coordinating cardstocks to create the Top Note Background accent. This is a very colorful card using Rose Red, Tempting Turquoise, Old Olive, Pumpkin Pie, Whisper White, Early Espresso, and Sahara Sand. 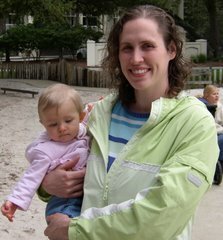 All content, including designs, concepts, text, and photographs are COPYRIGHT ©2009 Gretchen Belanger. Original artworks are shared for your personal inspiration and enjoyment only and may not be used for publication or design contest. Thanks so much for your support!